Colossal Figures | OK Listen! Formed in the last month of 2009, a conglomerate of near ideologies parenthesized together to deliver an exemplary sonic experience. Even with a diverse individual background, the resonance of musical repartee fundamentally drove them to a near utopian contribution to the idea that began as metalcore, but quickly metamorphosed and evolved to a progressive standpoint, while still being true to their roots. The idea was not just bent upon a particular element of being as a state of deliverance of either heavy musical connotations, or thought-provoking lyrical content, but depended upon a multidimensional approach to project unto the listener a thought field which relied upon not only fundamental objectivity, but also, paradoxically , the least focused upon intricacies of life itself. Traveled all across the nation, and loved dearly all across the board, from small town colleges, to big city arenas, their appeal has been universal. 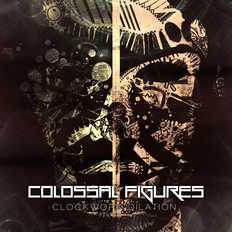 Their debut album, Clockwork Dilation, is expected to release in the Summer of 2013, followed by an all out nationwide tour, covering a plethora of events.